Working for Generali was a mixed blessing for several people gifted with artistic talent, who found the work either a source of inspiration or simply of financial stability: young writers, experienced poets, poor scholars or established painters. Well known or niche, and however talented as insurance brokers, they were able to marry their employment and their passion for art, allowing society to enjoy their skills and their cultural contribution. Napoleone Giovanni Fiumi was one such man. Born in London in 1898 (to a Genoese family), he began his artistic education as an autodidact. In 1925, he set out on a career as a broker with Securitas Esperia, already a part of the Generali Group at the time. It was during this time that Fiumi distinguished himself artistically, with “an elegant breeziness in his portraits, and the freshness of his colours […] especially in his landscapes; mellow and with a delicate balance between realism and post-impressionism” as Claudio H. Martelli wrote in his Dizionario degli artisti di Trieste, dell’Isontino, dell’Istria e della Dalmazia [Dictionary of Artists from Trieste, Isonzo Area, Istria and Dalmatia]. Martelli also noted his gifts as a painter of portraits, engraver and illustrator. His works were displayed at the Biennali of Venice and Brera, the Quadriennali of Turin and Rome, and at the Paris Salon. He had personal exhibitions in Genoa, Budapest and Milan, where he was a member of the group of painters who would meet in Bagutta, a historic trattoria and gathering place for writers, artists and journalists. In the Lombard capital, he worked as a deputy broker with the general agency of Assicurazioni Generali between 1932 and 1938 (afterwards, in 1939, he moved to the main agency in Genoa). At the same time, he was also busy as an art critic, serving as the Italian correspondent for the London magazine “The Studio”. In August 1940, he was transferred to the general agency in Trieste. The economical management of the agency for all the insurance classes was held by the company and by the Anonima Grandine and Anonima Infortuni subsidiaries. In Trieste, Fiumi participated in multiple collective exhibitions, receiving wide praise from both the public and local critics. Generali itself acquired a few of his paintings and made use of his talent in its magazine, “il Bollettino”. 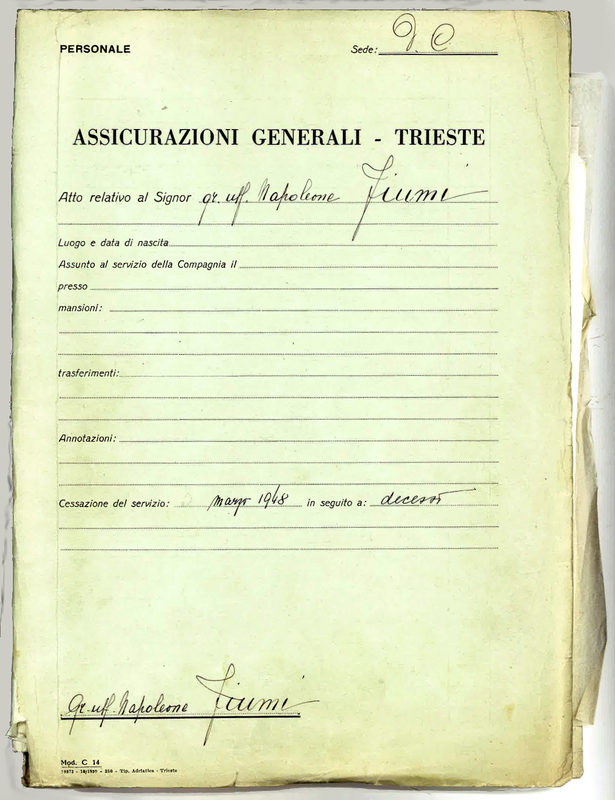 The papers from his personal file, preserved in the Historical Archive of Trieste, shed light on Fiumi’s work as an insurance broker. The documents date back to the years he spent in the city as a general agent, from 1940 to 1948, and mostly relate to earnings and entitlements derived from his work in the transportation sector. There is very little relating to his personal life. He married Elisa Torriani in March 1921, and was a father of four daughters. In 1933 he was awarded the title of Grand Officer of the Crown of Italy. 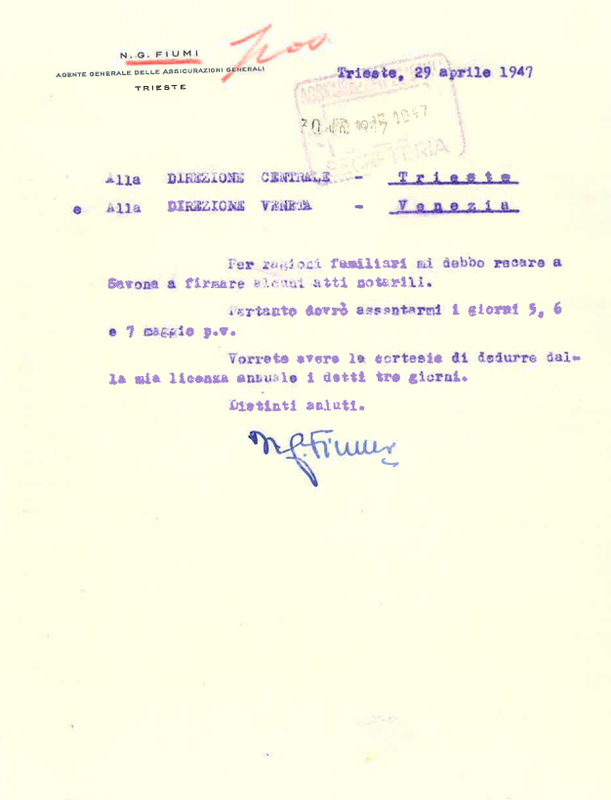 During the Second World War, Fiumi was given responsibility for maintaining communications between the Central Head Office of Trieste and the offices in Milan and Venice, dealing with relations with Allied government representatives in Trieste, the regional capital.